The reference for quality wines from Roussillon, Languedoc and Provence. Terroir: Faugères is a small appellation located on the somewhat inland on the Mediterranean coast to the west of Montpelier and Nimes. Vinification: This blend of Syrah, Mourvèdre and Carignan is vinified in a combination of 10% tank, 30% large nuetral oak casks and 60% oak barrels. 30% of the oak is new. The beautiful ripeness of Syrah is very well balanced due to magnificient tannins of the finest Mourvèdre, allied with a minerality, most characteristic of the Faugères terroirs. The wine is concentrated, voluptuous and elegant with beautiful freshness and great finesse. Its very strong mineral character shares Cade wood and blackberry-pie scent added to floral aroma violet. "A muscular but refined red, bursting with wild berry, herb and spice notes, underpinned by accents of cured meat and tea. Tangy acidity carries into the floral and fresh earth aromas on the finish. 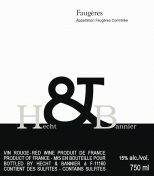 Syrah, Mourvèdre and Carignan. Drink now through 2023."